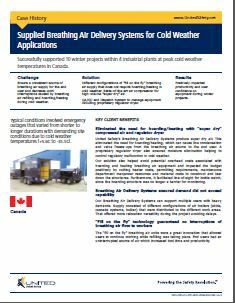 Description: United Safety supported 10 projects within 4 industrial plants at peak cold weather temperatures in Canada. The challenge was to ensure a consistent source of breathing air supply for the end user and decrease work interruptions caused by breathing air refilling and hoarding/heating during cold weather. We proposed different configurations of “fill on the fly” breathing air supply that does not require hoarding/heating in cold weather, and positively impacted productivity and user confidence on equipment during winter projects.